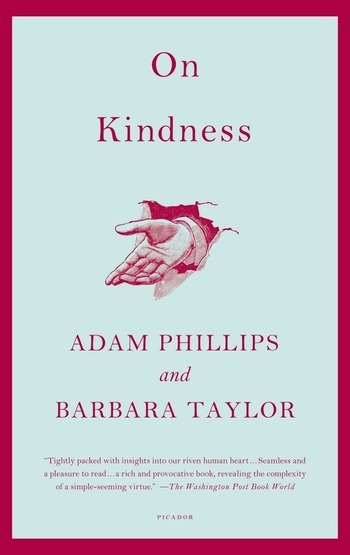 Kindness is the foundation of the world's great religions and most-enduring philosophies. Why, then, does being kind feel so dangerous? If we crave kindness with such intensity, why is it often the last pleasure we permit ourselves? And why—despite our longing—are we often suspicious when we are on the receiving end of it? Drawing on intellectual history, literature, psychoanalysis, and contemporary social theory, this brief and essential book will return to its readers what Marcus Aurelius declared was mankind's "greatest delight": the intense satisfactions of generosity and compassion. Adam Phillips is a psychoanalyst and the author of twelve books, all widely acclaimed, including On Kissing, Tickling, and Being Bored; Going Sane; and, most recently, Side Effects. Barbara Taylor has published several highly regarded books on the history of feminism, including the award-winning Eve and the New Jerusalem. She and Adam Phillips both live in London.